Providing and installing Siphon water filter units including storage drum with lid, tap and tumbler in 35 Government Primary School premises for the use of rural students numbering 2,199 in the Sethubavachatram block of Tanjore District, Tamilnadu. indru pinnavasal villagela 3 members vittirkku pesmatta alavukku velai parkkappattana. till date 11 members contribution amt collected. for 8 houses kept hollow block and sand. 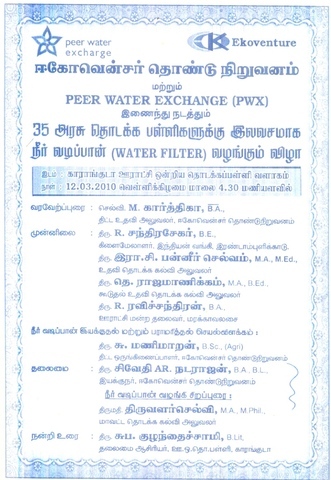 The Water Filters were distributed to the selected Government Primary Schools in the function conducted on 13.03.2010 at the Premises of Government Primary School, Karanguda. During the past four months, awareness creation meetings were conducted in the 35 Government Primary Schools among the School children and staffon the importance of purified drinking water, demonstration on the use of Siphon water filters. Arrangements were also simultaneously made for the purchase of Water Filter, Stainless steel drum with tap and lid and construction of slab/stand to seat the drum. Now, it has been proposed to organise a function involving the higher officials of the Education Department, Indian Bank and elected member of PRI to distribute the Water Filters to all the 35 Schools. The Programme will be organised on 12.03.10, 4.30 P.M at the premises of the Primary School, Karanguda. A copy of the invitation in local language is attached.